Global Technology Systems’ patented Genius Batteries ™ solve the challenge of knowing exactly when to replace a battery. Millions of workers around the world rely on mobile IT devices to do their jobs, but have no way of knowing if they can rely on their battery to power them through their shift. Genius batteries provide unmatched insight into the State of Health (SoH) of the battery, allowing workers to know exactly when it should be discarded. 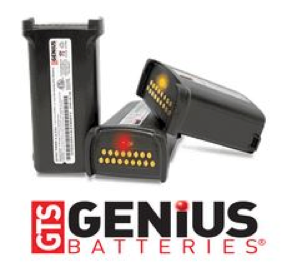 With tens of thousands of Genius Batteries™ in use today, GTS is changing the way that businesses think about battery power. In countless retail and distribution settings, GTS has found an uncontrolled mixture of good and bad batteries, which invariably leads to confusion, work stoppages, device maintenance problems and unnecessary expenditures. Until now these workers have had no insight into the health of their batteries. Genius Batteries™ go beyond conventional “smart batteries” to deliver a deeper and more accurate measure of a battery’s health without the need for additional equipment. Every Genius Battery™ contains an advanced memory chip that continuously calculates the battery’s SoH, providing an up-to-the-minute visual status of its condition. Genius Batteries™ put the critical information where it belongs— in the hands of the users—so they know exactly when to replace the battery: Not too soon, and not too late. Each Genius Battery™ utilizes a built-in LED indicator to inform the user of its SoH at all times. As the battery is used and its health declines, the LED indicator turns yellow, informing the user that they should order a replacement. When the LED turns red, the user knows the battery is no longer reliable and should be replaced. These lights are simple to understand and indicate exactly when to reorder and replace the battery. Genius Batteries™ allow businesses to take control of their battery population, which results in increased efficiency, productivity, and dramatically reduces the expense of buying new batteries and maintaining devices. Zebra’s Newest Receipt Printer is a Game Changer!